Mirne splhani po skalach, ovsem nezapomenutelny vyhled na krajinu Morvaskeho krasu :). Moderate climbing rocks, of course, unforgettable views of the countryside Moravian Karst :). Prestoze ma hrozivy nazev, nezahynul zde zadny clovek ani zde neni zadna hluboka propast. Jelikoz v kraji neni zádna voda, protoze je vsechna schovana v podzemi, vynasela se zde smrtka do jeskyne misto obvykleho hození do potoka. Odtud teda ten nazev. Jeskyne je pomerne vysoko nad udolim, 100 metru od vesnice Vilemovice. Nachazi se na kerove strani plne bilych skalek. Vchod je asi 10 metru nad silnici Ostov-Vilemovice, avsak v lete kvuli bujne vegetaci nepostrehnutelny. V jeskyni byla znicena krapnikova vyzdoba. Delka jeskyne je 130 metru a Hlavni chodba se po 35 metrech deli na chodbu Nizkou a chodbu Vilemovickou. I do této diry je mozné se bez problemu dostat. Do kesky jsem dala malou tuzku, ale muze se stat, ze se tuha casem vylomí, proto radeji doporucuji vzit si svoji tuzku. Ohledne terenu davejte pozor na cestu a to hlavne po desti - klouze to tam. Take si davejte pozor na deti, jestli je berete sebou, v oblasti kese je silnice! :) Preji prijemne hledani. Although having a terrible title, shall not perish here no one man or there is no deep divide. Because the region is no water, because it is all hidden underground, brought in here in Death Cave habitually toss into the stream. From there, I mean the title. The cave is quite high above the valley, 100 meters from the village Vilémovice. Located at bush parties fully of white rocks. The entrance is about 10 feet above the road-Ostov Vilémovice, but in the summer because of lush vegetation imperceptible. The cave was destroyed stalactite decoration. Length of the cave is 130 meters and the main hall the deli after 35 meters into the hallway and low passage Vilemovickou. And in this hole can I get without problems. Into the cache, I gave a little pencil, but it may happen that the graphite Over time, exclusion, therefore, recommends to the Council to take his pencil. Regarding terrain, beware of the way and especially after the rain - there was slippery. 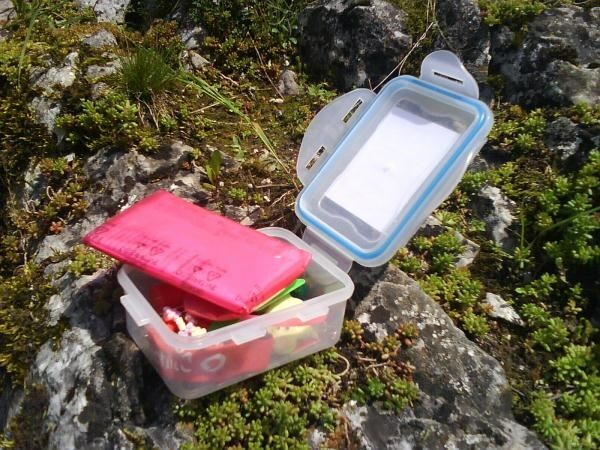 Take your kids to be careful, if you take them, the cache is the road! :) Have a nice searching. P.S. - KDYŽ UVIDÍTE OHRADNÍK - NEJEDNÁ SE O SOUKROMÝ POZEMEK!! Pasou se tam pouze ovce.